Amanda Seyfried has revealed she'd be prepared to change her entire life for the right man - but she would never ditch her pet dog Finn. 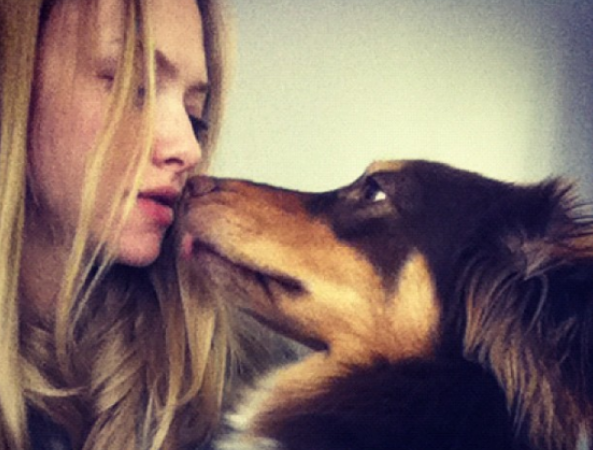 Amanda Seyfried would travel anywhere for the man of her dreams - as long as she could take her dog too. The Lovelace actress - who is currently dating actor Justin Long - believes in true love and would be prepared to make many sacrifices for a guy, but she wouldn't ditch her pooch pal Finn for anyone. When asked if she'd move her life for love, she said: "I would go anywhere to follow the man of my dreams. As long as I could bring Finn along! I would even exile myself to the countryside and become a housewife. If I had to, I would give up my whole life, my job, everything, to be with him. At the same time, I hope I would never have to make that choice because I love my life the way it is!" Amanda - who spent a lot of time in the UK when she was in a three-year relationship with her Mamma Mia co-star Dominic Cooper - would always put her love life ahead of her career. The 28-year-old star's ultimate dream is to settle down and have a family but she isn't ready to become a mother yet. Speaking to France's Grazia magazine, she said: "Work is important, but it's nothing compared to love. Having children with the personal you love in wonderful. I want to be in that position in future, but don't quite feel ready yet."